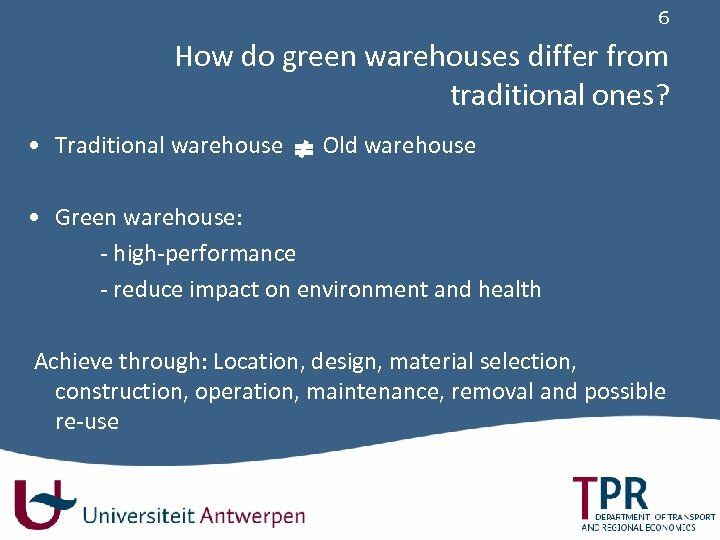 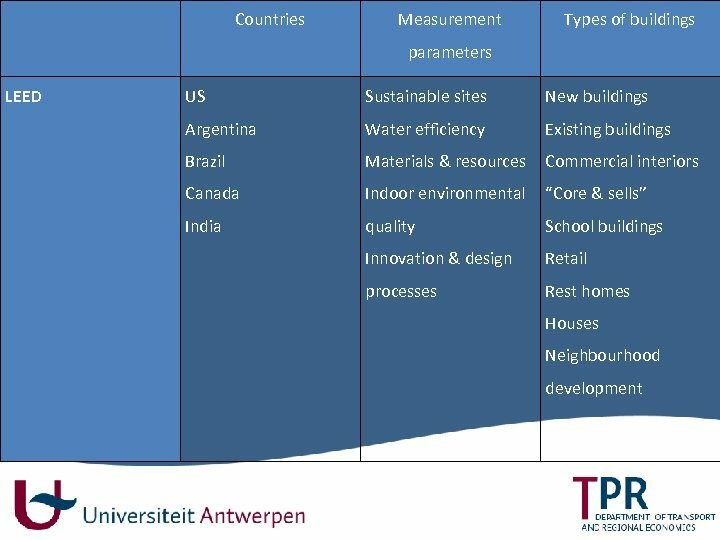 5 Research questions • How does a green warehouse differ from a traditional warehouse? 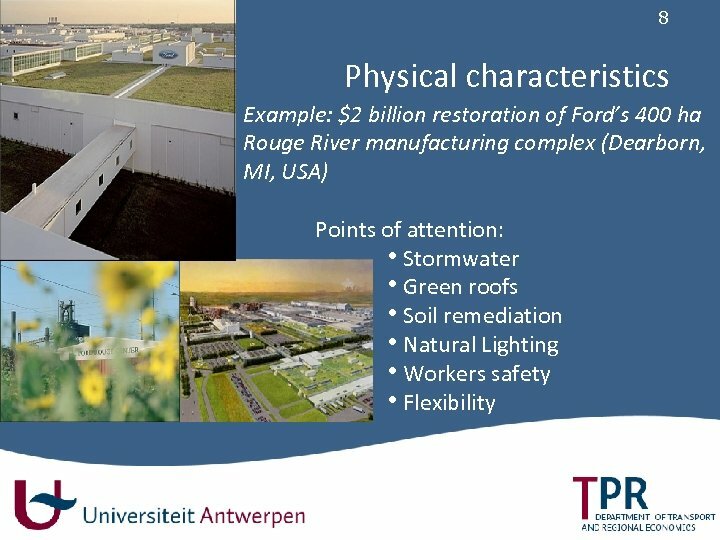 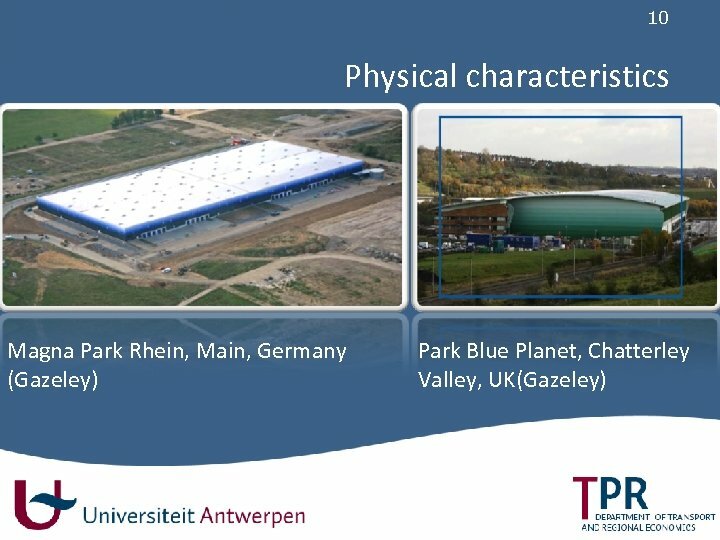 • What are the difficulties in the financial valuation process of green warehouses? 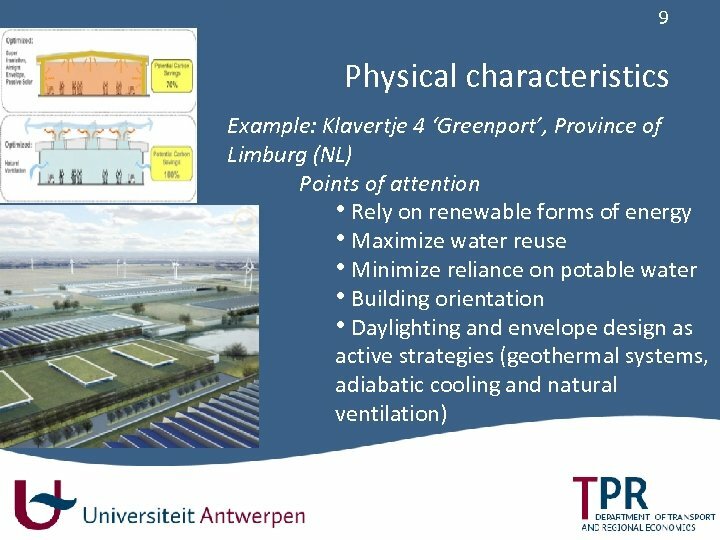 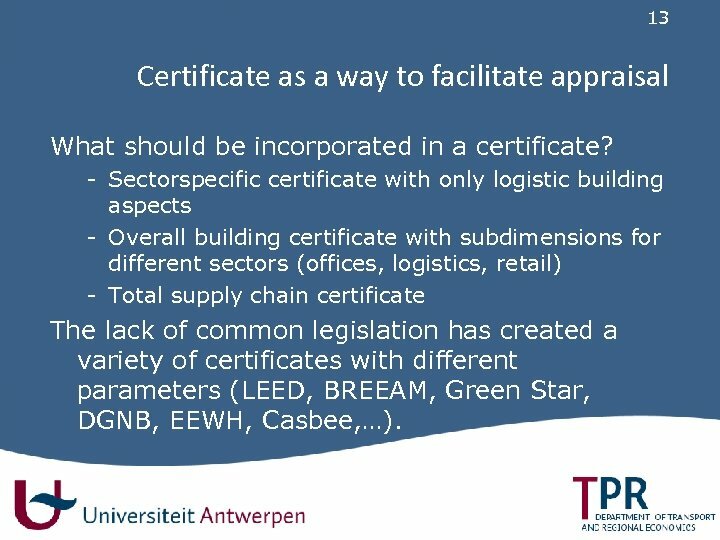 • Can a certificate facilitate the appraisal of green logistic warehouses? 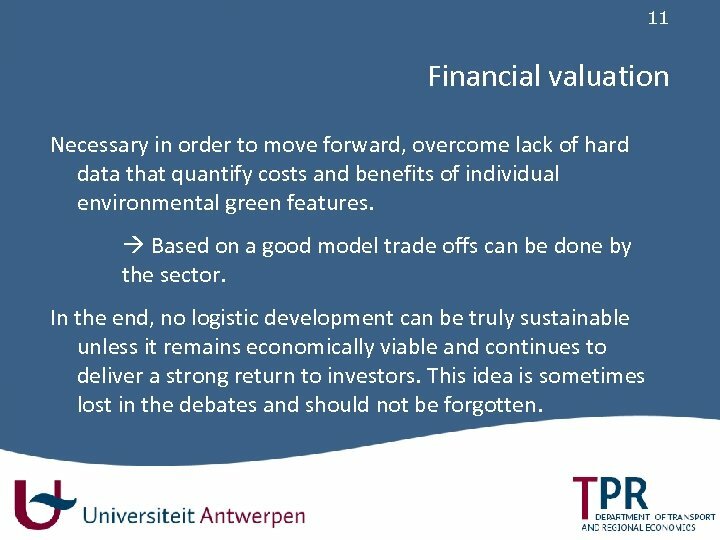 11 Financial valuation Necessary in order to move forward, overcome lack of hard data that quantify costs and benefits of individual environmental green features. 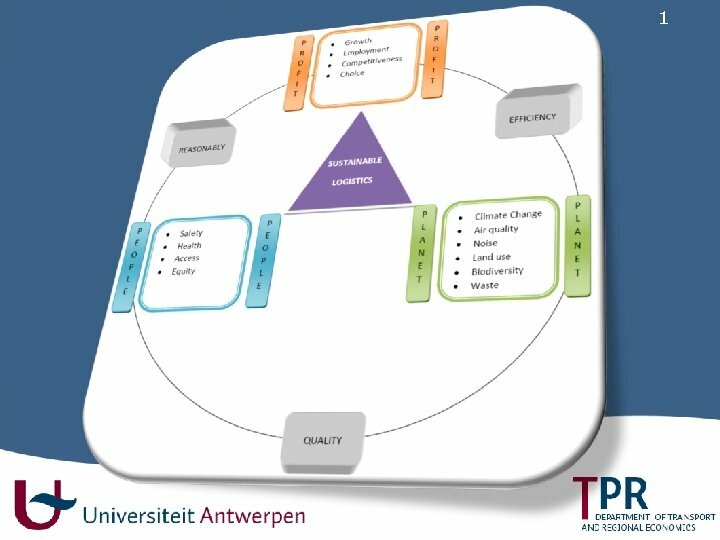 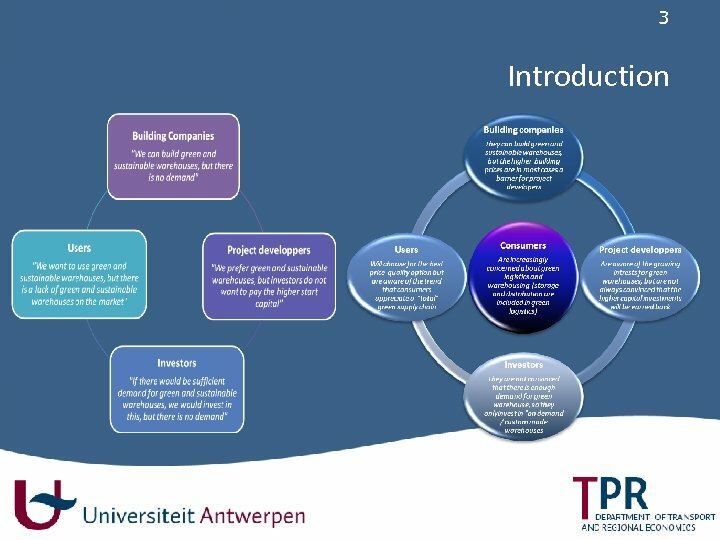 Based on a good model trade offs can be done by the sector. 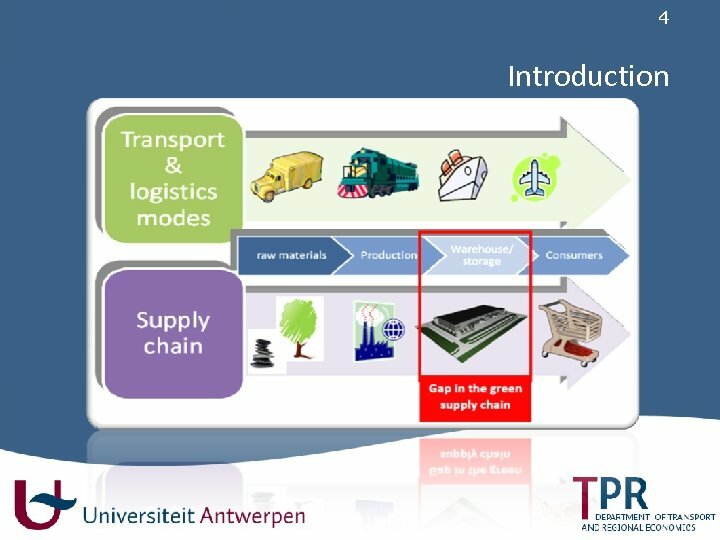 In the end, no logistic development can be truly sustainable unless it remains economically viable and continues to deliver a strong return to investors. 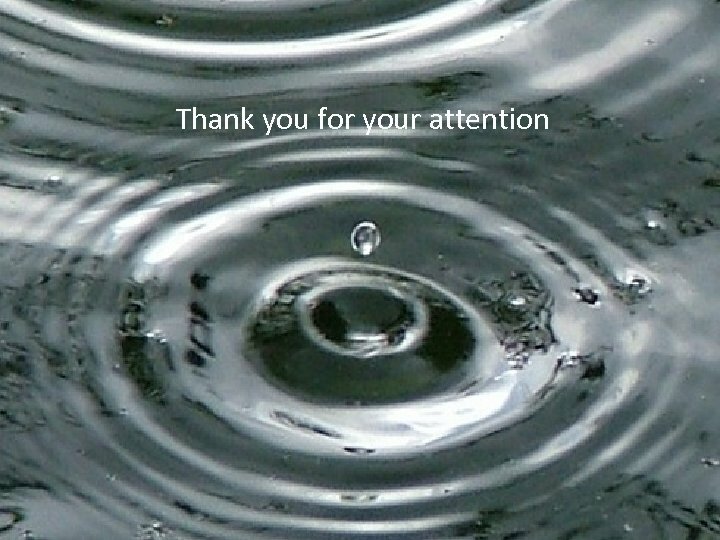 This idea is sometimes lost in the debates and should not be forgotten. 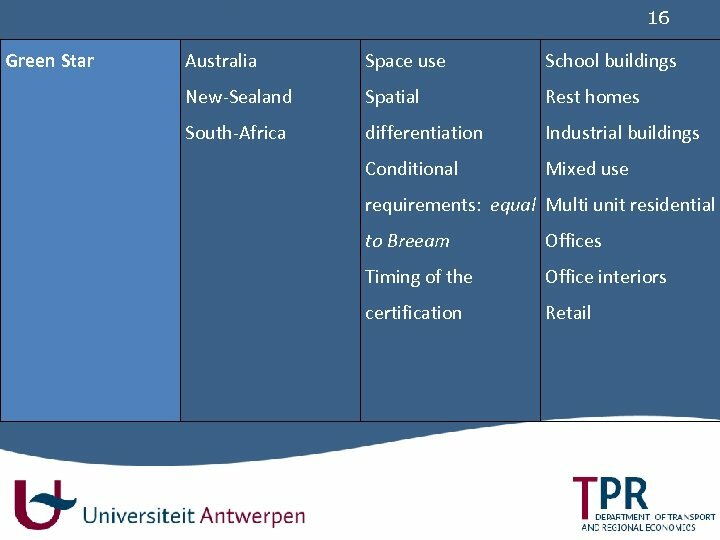 13 Certificate as a way to facilitate appraisal What should be incorporated in a certificate? 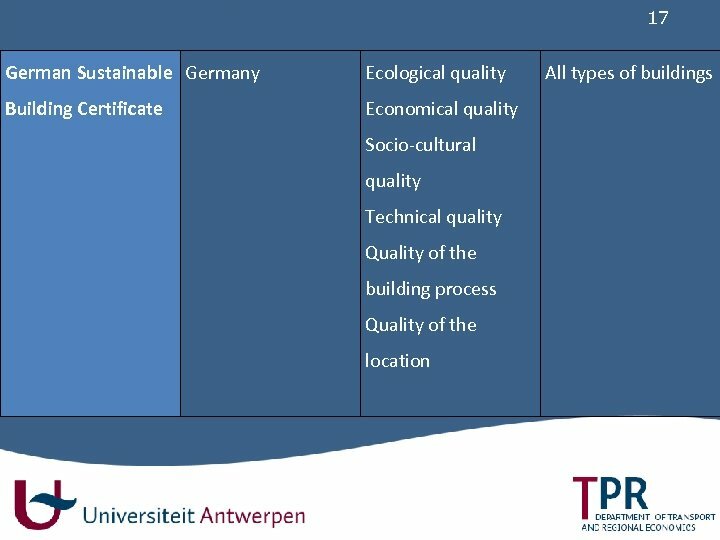 - Sectorspecific certificate with only logistic building aspects - Overall building certificate with subdimensions for different sectors (offices, logistics, retail) - Total supply chain certificate The lack of common legislation has created a variety of certificates with different parameters (LEED, BREEAM, Green Star, DGNB, EEWH, Casbee, …). 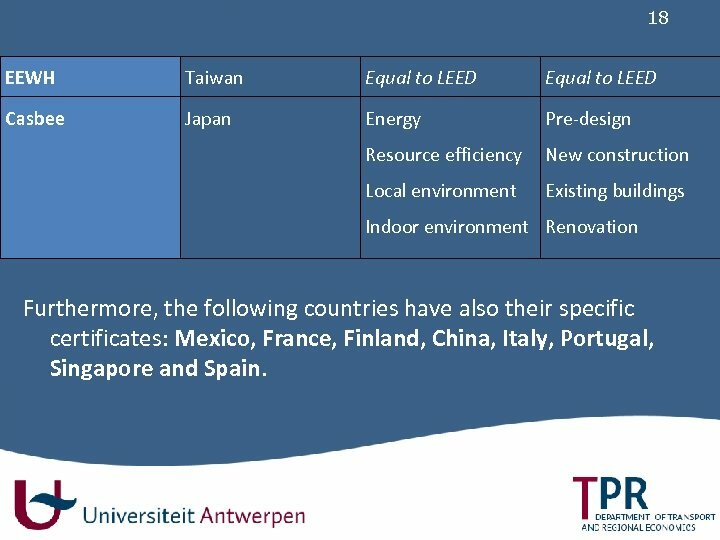 18 EEWH Taiwan Equal to LEED Casbee Japan Energy Pre-design Resource efficiency New construction Local environment Existing buildings Indoor environment Renovation Furthermore, the following countries have also their specific certificates: Mexico, France, Finland, China, Italy, Portugal, Singapore and Spain. 19 Certificate as a way to facilitate appraisal One clear, standard and transparant certificate is needed for the real estate market that is dominated by international operations. 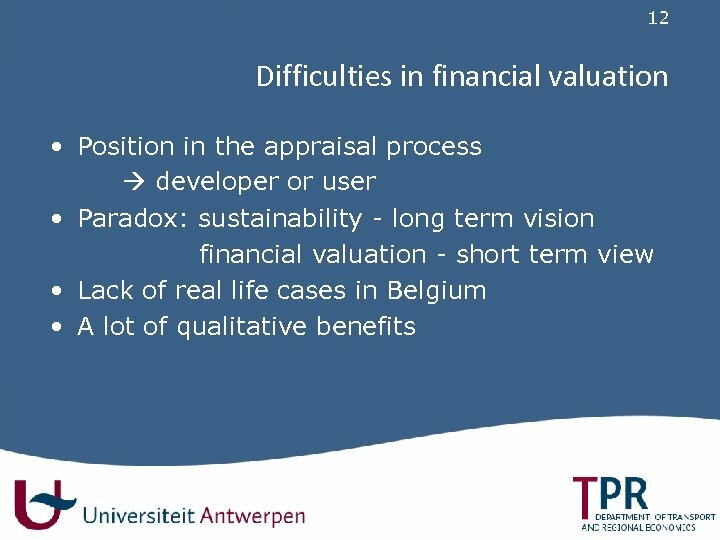 This would facilitate comparability and would facilitate therefore the appraisal process. 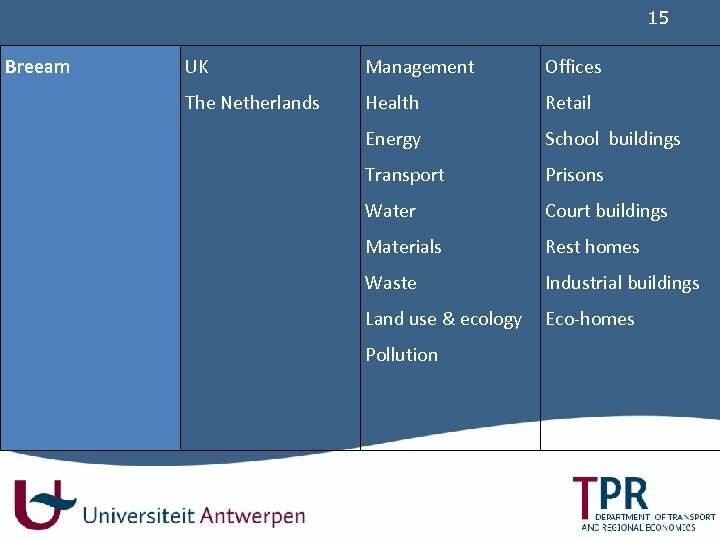 20 Conclusion Building green warehouses? 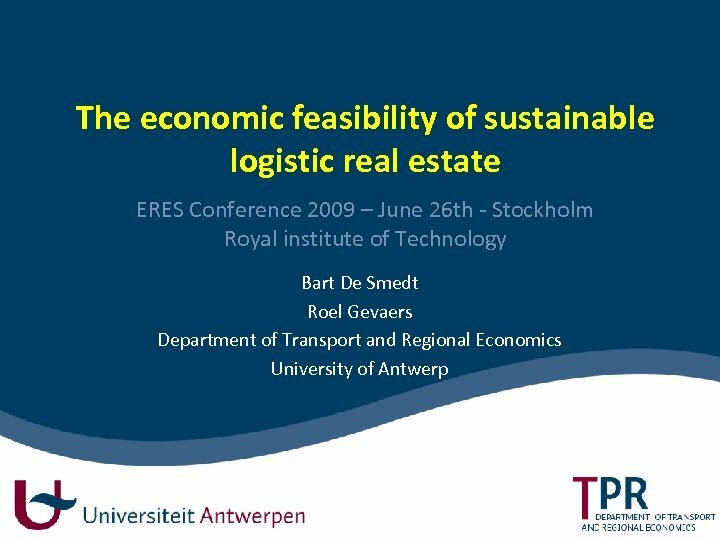 All the stakeholders are willing but without certainty about the economic feasibility it stays problematic. 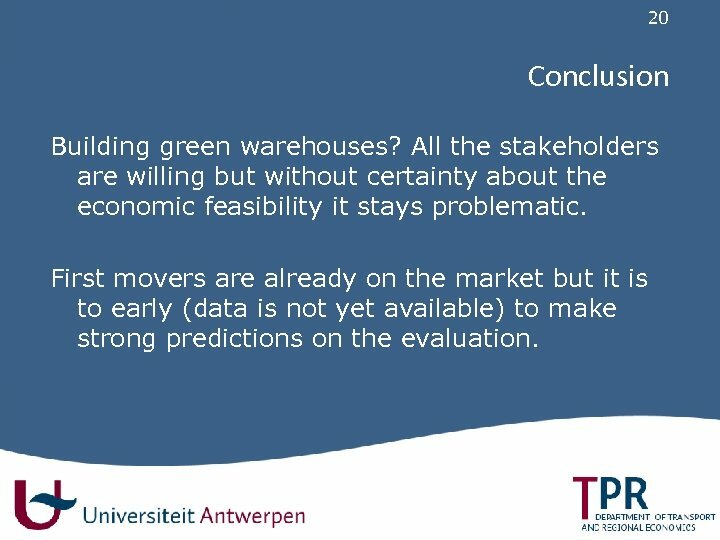 First movers are already on the market but it is to early (data is not yet available) to make strong predictions on the evaluation.